Highlights the highways, tramways, and bus routes of Memphis. New Edition Pocket Map of Memphis. 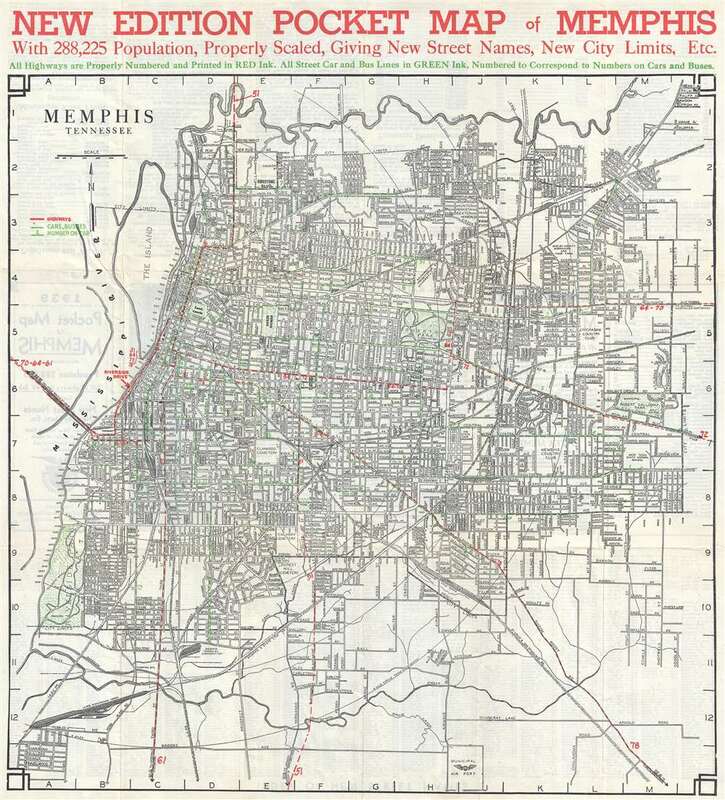 This is a 1939 Memphis Chamber of Commerce city map or plan of Memphis, Tennessee. The map depicts the city from the Mississippi River to the City Limits and from Wolf River to the Municipal Airport. Highly detailed, myriad streets throughout the city are illustrated and labeled and a street index is provided on the verso. The most striking aspect is the use of colored lines to highlight the city's highways, tramways, and bus routes. Highways are marked by red dashed lines and are 'properly numbered' as all U.S. highways are numbered. Bus and tram lines are indicated by green dashed lines and are also labeled by number. Arrows appear on parts of these lines to indicate in which direction the bus or tram is traveling. This map was published by the Memphis Chamber of Commerce in 1939. We are aware of one example in an institutional collection. Very good. Even overall toning. Light wear along original fold lines. Text on verso.